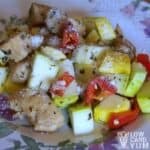 Are you following a low carb way of eating, but also try to follow a Paleo lifestyle? 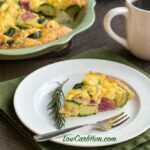 Try this yummy Paleo crustless zucchini radish quiche. 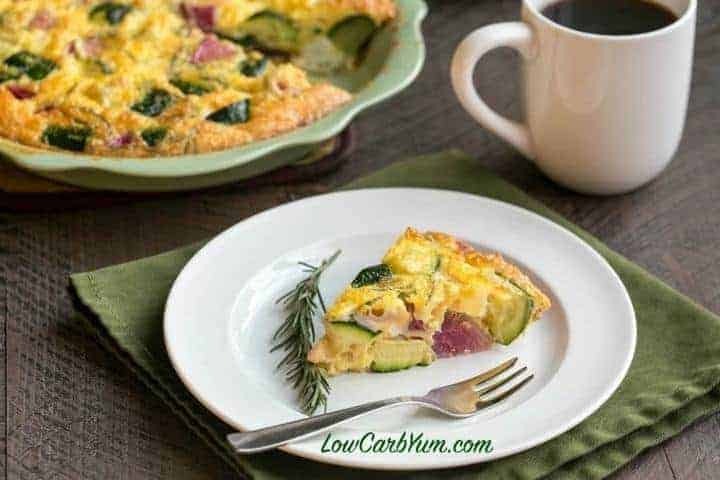 When I first started on low carb, I used to make a lot of quiche. The dish is so easy to put together. Particularly if it’s a crustless one. I rarely make quiche these days, but found a terrific recipe by Vivica Menegaz in the new Ultimate Paleo Cookbook. 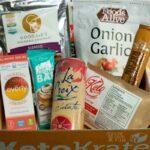 I’ve been following Vivica’s blog at The Nourished Caveman. 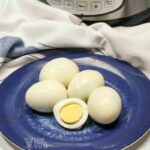 She has a lot of terrific low carb recipes. She is also Vivica a certified nutritionist and the creator of the Healing Foods Method. I was thrilled when Vivica asked if I’d like to take a look at the Ultimate Paleo Cookbook. 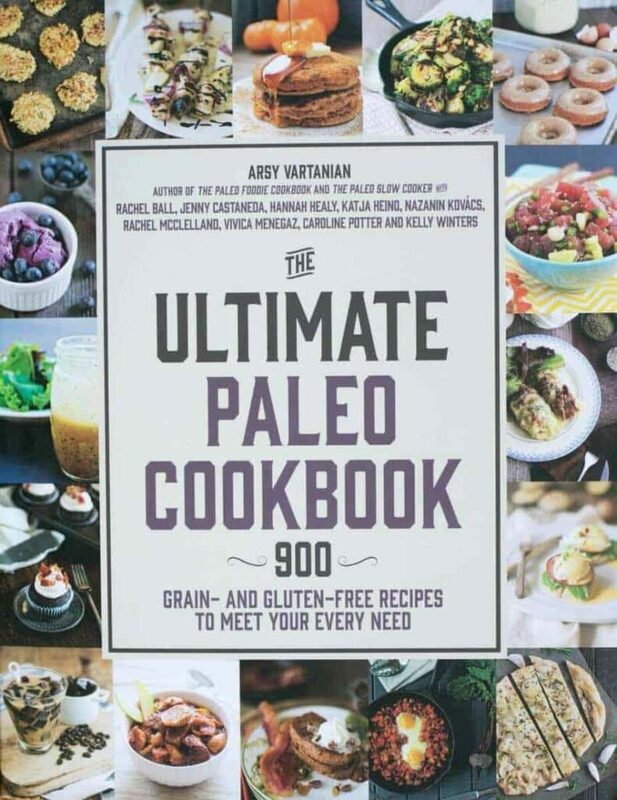 It’s a fabulous collection of 900 Paleo recipes. Vivica is one of the contributors. 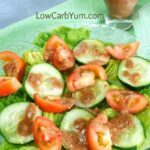 Although not all the recipes are low carb, I knew I’d find a great low carb recipe from Vivica in the cookbook. I’ve been trying to move to a more Paleo diet, but the sweeteners and dairy keep me to a more Primal style diet. The only low carb sweetener allowed on a Paleo diet is stevia and I just haven’t been able to get the right sweet taste using it alone. It’s always best to add in erythritol. Dairy products aren’t allowed on Paleo either. And, it’s nearly impossible for me to give up cheese and heavy cream. I know that dairy can be inflammatory, but it’s just too delicious to give up. I typically add cheese to quiche when I make it. However, since this is a Paleo recipe, there is no cheese in it. Guess what? I didn’t miss the cheese! Vivica’s recipe calls for fresh herbs and I used rosemary. The flavor of the herb more than made up for not having cheese. So, maybe I just need to up the herbs and spices in my own recipes! Vivica’s recipe in the cookbook is a crustless zucchini turnip quiche. I wasn’t able to find any salad turnips so I used some watermelon radishes instead. The watermelon radishes really made the color of the dish pop. The name fits them well as they look like mini watermelon slices when cut. 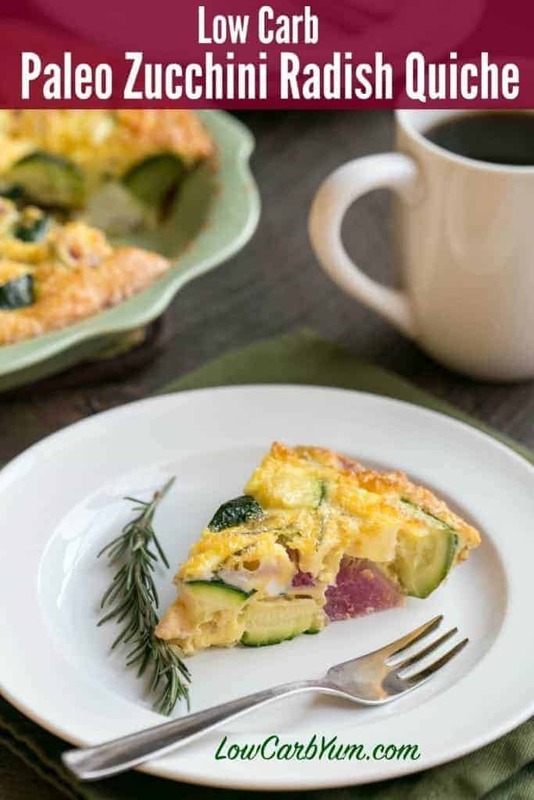 If you’re a veggie lover, this Paleo crustless zucchini radish quiche recipe is sure to please! It’s chock full of yummy vegetables. And, check out the gorgeous colors of these veggies in the finished quiche! I decided to bake the quiche in a pie dish. Vivica’s recipe calls for an 8×8-inch baking pan and she recommends cutting it in squares. However, I went for the more traditional round shape. 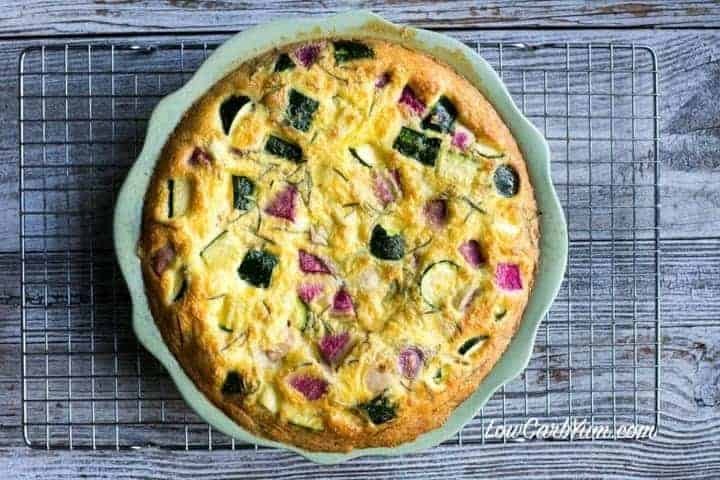 I was really happy with how this crustless zucchini radish quiche recipe turned out. It’s going to made often from now on and I’ll change up the spices and vegetables to give it different flavors. Who needs cheese when herbs and vegetables give all the flavor you need? 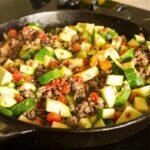 If you are trying to move to a more Paleo diet, The Ultimate Paleo Cookbook is a great way to get started. 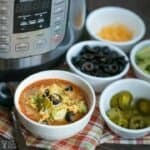 With over 900 recipes, there is sure to be a ton that you will want to try right away. 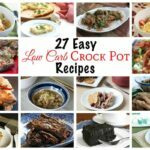 Even though it’s not a low carb cookbook, it’s fairly easy to convert most of the recipes if you’ve been low carbing for a while. 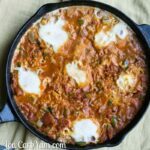 The recipes in The Ultimate Paleo Cookbook come from Arsy Vartar and nine other popular Paleo bloggers. Arsy is the founder of the Paleo recipe and lifestyle blog, Rubies and Radishes and has authored two other Paleo cookbooks. It was nice to see the low carb blogger Vivica Menegaz featured in the book. Her recipes are some of my favorites which is why I wanted to try her quiche recipe and feature it here. 1 bunch fresh herbs thyme, rosemary, tarragon, chives, etc. Preheat oven to 325°F (170°C, or gas mark 3). Grease a 9-inch pie or 8x8-inch baking dish. Set aside. Blanch the zucchini and let it cool. Once cooled, chop into 1-inch pieces. Heat ghee in skillet over medium heat and saute garlic until fragrant. Add the zucchini to garlic and saute until cookied through, about 5 minutes. In separate bowl, whisk the eggs and coconut cream together with the hers and pinch of salt. 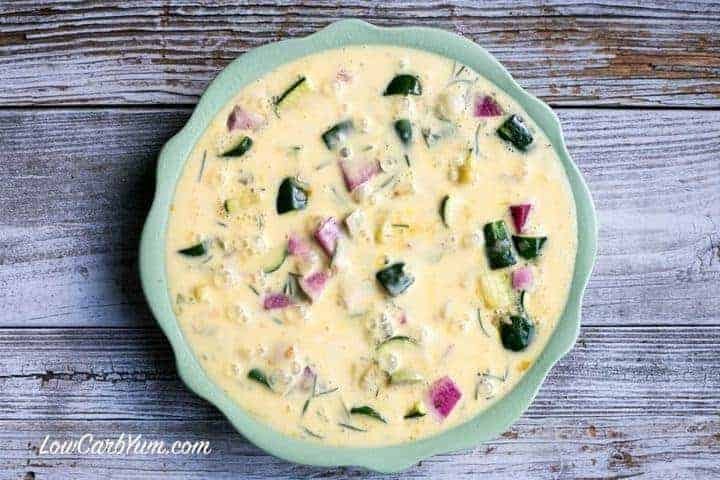 Line baking dish with zucchini and radishes (or turnips) and cover with egg mixture. Bake for 45 minutes or until browned on top. 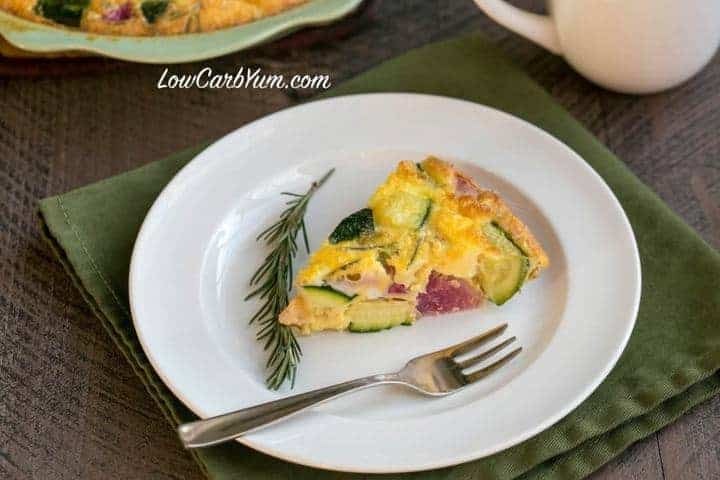 Adapted from the Crustless Zucchini and Turnip Quiche recipe by Vivica Menegaz featured in The Ultimate Paleo Cookbook. Would like to try this recipe. 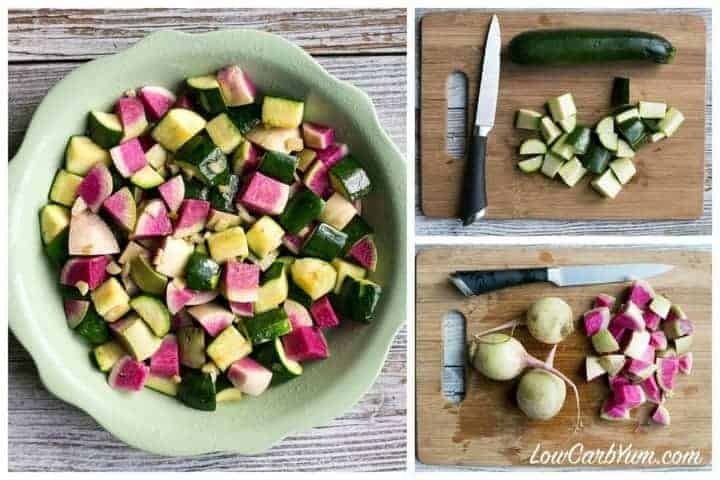 Can regular radishes be used instead of the salad turnips or watermelon radish. I’d love to try the watermelon radish, but can’t find them or the salad turnips. Thanks. Certainly! I just used the watermelon ones because I stumbled upon them at Whole Foods Market. 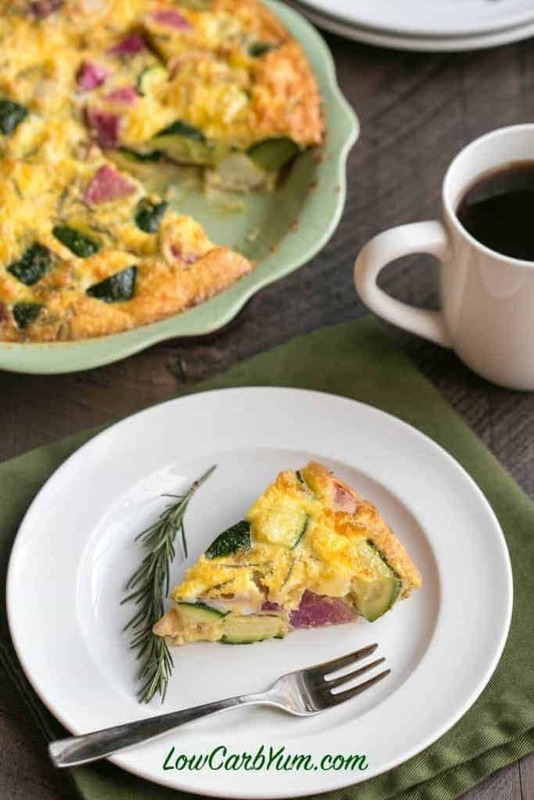 This quiche looks absolutely delicious!! This looks delicious!! Thank you for sharing! 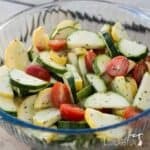 Wow this is great, simple and easy to prepare plus loads of veggies which I love very much. Will give this a go. 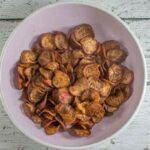 Love this idea and that you can use veggies and spices instead of cheese! trying this out tonight!